We recently finished this north Denver interior design project, and what a change it has made for these wonderful clients! The public areas of the home received a major refresh, while we gutted the master bathroom and started over. In this post, we’ll show you the refresh, and next month we’ll reveal the extent of the master bath overhaul. The homeowners were officially over their ’90s kitchen with tired cabinetry and dated countertops. Since the layout of the space was functional and the cabinets were in great shape, we opted to keep them and update them with an antiqued white finish. 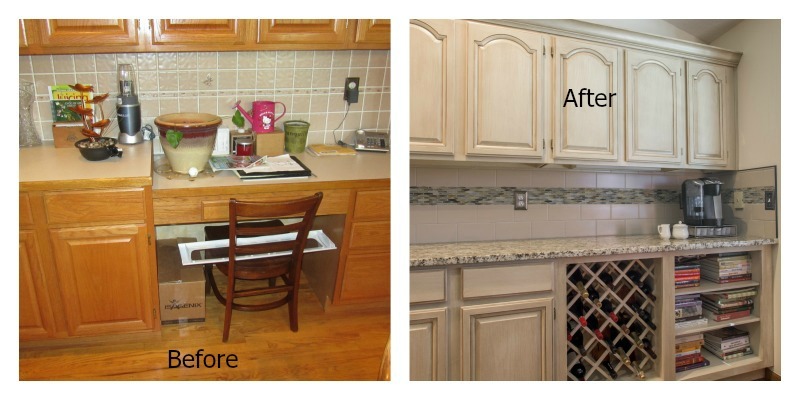 We replaced the laminate countertops with a clean, bright granite and added a contemporary tile backsplash. Possibly one of the best changes to this space was taking down the raised bar to create one large island surface that is more conducive to working and gathering. And dropping the bar down created much better connection between the eat-in area and the rest of the kitchen. The homeowners struggled with interior decorating and accessorizing the large area above the cabinets by using items that were out of scale — too small. Large artwork that fills the space draws the eye up and enhances the grand feel of the vaulted ceilings in this ranch home. Smaller accessories fill in the gaps and add visual interest and a punch of color. While the idea behind the kitchen desk seems noble and it was probably used for its purpose for a while. But for many people it just ended up being the dumping ground for things that didn’t have a place or filled with clutter such as mail and the kids’ school papers. So, we removed the desk space here and replaced it with more appropriate storage — books and wine. Removing carpeting and adding wood floors creates a seamless look throughout the public areas of this home. A new coat of stain in a slightly darker color gives these oak floors a rich, warm look. The dining room went from bland to bold thanks to a punchy floral wallpaper and new window coverings. New furniture and pillows draw color from the dining room wallpaper creating a connection between the two spaces. Gone is the faux paint creating a dated and dark home office. Light wallpaper in a bold geometric pattern brightens up the room, creating a more inviting space for work. A new armchair and window coverings complete the look. Be sure to check back next month to see the major master bathroom renovation in this home. Click here for more information on Beautiful Habitat services. Inspired by this north Denver interior design project? Contact us today to refresh your own home.